With the rise of technology, cyber security skills are in high demand. Careers in technology fields are growing, which is why one local middle school has started implementing cyber security into their classrooms. McNair Middle School is teaching their students cyber-safety skills with the help of a deck card game called Cyber Threat Defender. A collaborative effort with the University of Texas at San Antonio’s (UTSA) Center for Infrastructure Assurance and Security (CIAS) has allowed students the opportunity to gain college-level skills at a young age. 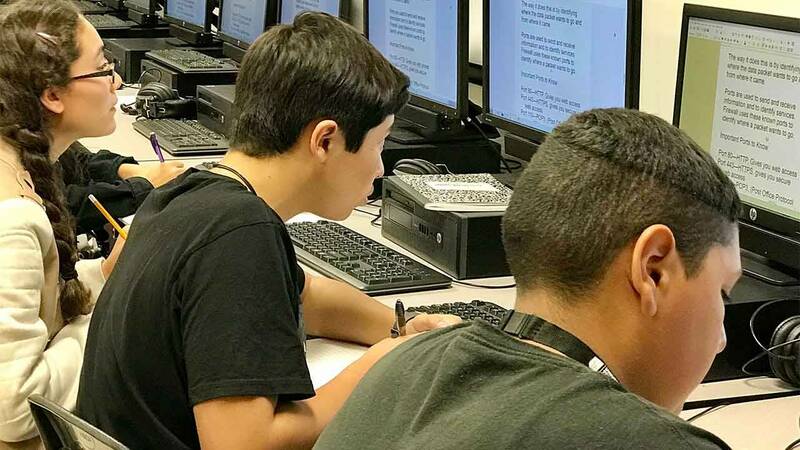 SciTech Now takes you inside the classroom of Michael Maldonado to learn how preparing students for a future in cyber security is the next step to developing a more secure network. The objective of Cyber Threat Defender is to develop a way to help students understand the nature of creating a responsible secure network. From uploads and cloud accounts to web cams, the potential entry portal for hackers, malware and viruses exist. The game allows students to understand concepts like firewalls, power outage and anti-malware by engaging students and encouraging them to strategize defenses. “You need to have these skills. You need to know about passwords. You need to know that the world isn’t as friendly online as we’d like to think it is,” said Maldonado. Through the cyber security class students are able to utilize the skills they learn and put them into practice. By providing feedback and brainstorming as a classroom, the students are better prepared for when they enter the workforce. “The kids are seeing the way the world really is in the workplace. There’s collaboration … if you have a problem, you can communicate that so that changes are made,” said Maldonado. Watch this episode of SciTech Now airing Friday, Nov. 11 at 7:30 p.m. on KLRN.